The Avocet is a social bird preferring to nest in colonies and in winter forming large tight flocks on feeding grounds. 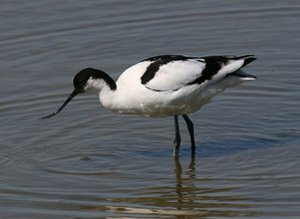 The Avocet is the emblem of the RSPB due to it's success at encouraging breeding pairs in the UK. Avocet feeding and swimming which they frequently do. A slender elegant bird the Avocet feeds by sweeping its bill back and forward through the water. 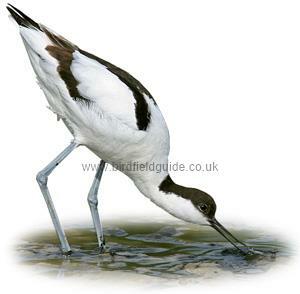 Note the head down posture of this bird which is typical of the Avocet. 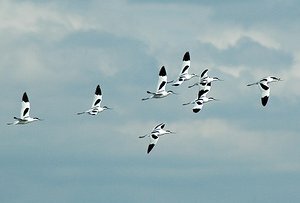 Avocets are just as distinctive in flight, being mainly white with black wing tips and wing bars. From underneath they are completely white except for the wing tips. The Avocet is a mostly white bird with black wing tips, cap and wing bars. It is tall and slender with a long fine upturned bill and long blue-grey legs. Breeds on shallow saline coastal lagoons and bare ground around ponds near the coast. In winter on muddy estuaries, often roosting in nearby fields at high tide. 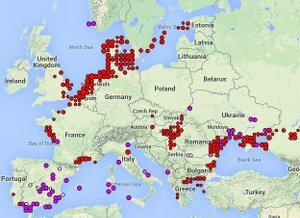 Mostly found in Southern Europe in the Mediterranean area and the SW of England. Once very rare in the UK there are now over 1500 pair breeding at managed sights on the South coast. In winter numbers are boosted by over 8000 migrant birds and large flocks can be seen on suitable feeding grounds, but only in the South of the UK.